I just received my new SuperMax expansion board for the Yamaha DX-7 mkI and wow! It sure changes the Yamaha DX-7 for the better. I get 64 new sounds that are programmed to take advantage of the new characteristics of the SuperMax chips and I must say I am really impressed. My Yamaha DX-7 sounds much fatter with voices that now can be stacked. There are 512 memory locations which means I can reliably store a lot of voices without them crapping out with the Gray Matter E! board that I previously had installed. The delay and detune features are fantastic for acquiring natural effects such as chorus. I also love the sound creator which allows you to invent new sounds by automatically combining random parameters between voices. The best thing of all is the arpeggiator. Wow! This arp is incredible to have on a Yamaha DX-7. I’ve had zero problems with it and it operates exactly as it should. I really like it. I have two Yamaha DX-7’s so I can use one to create rhythms that are quite complex using the arp and stacking. The other DX-7 can be used straight for playing my favorite lead or melodic sounds. Are there any bad points about the SuperMax? Well I’ve only used it for a couple of days and so far there is only one minor negative point. If correct that has to do with polyphony. The Yamaha DX-7 has 16 note polyphony so when you stack or split the voices this gets reduced rather quickly which results in clicks that can be heard. The clicks are common with any keyboard that is running out of polyphony as the same thing happens on my Korg M1 and T2. Indeed ghost notes happen when you completely step outside the 16 polyphony, but once you get the hang of your polyphony limitations, the SuperMax addition is golden and not a serious problem. I can’t imagine EVER going back to a stock Yamaha DX-7 after adding the SuperMax expansion board. It totally adds everything I’ve ever wanted on the DX-7 plus more. Note that I also have the E! Gray Matter Expansion board on my second Yamaha DX-7 and I must say the SuperMax knocks it out of the ballpark. I can’t wait to convert the E! Grey Matter over to the SuperMax once I find another expansion board. It’s not that I don’t like the features on the E! Grey Matter board, rather the board itself is just too unreliable for me. Perhaps I have a faulty board, but whenever I power it off for a period of time and then turn on the DX-7 the voices are all messed up. ( Note my battery is fresh and works great! ) It then takes time to load the voices in again and change my settings. The SuperMax is much easier, more reliable thus far, and much more user friendly. I just love it. Finally, the SuperMax expansion board is super simple to install. No soldering is required. You just carefully pull out IC14, IC 20 and IC21 and then insert the SuperMAX in place of the missing chips. You can then save for original chips for when you either remove the SuperMax for selling or if you get another old DX-7 that needs chips. Don’t throw away or sell your old chips. You’ll never know when you might need them again. – MEMORY EXTENSION: 512 Memory locations for sounds and functions. – ARPEGIATOR: the most sophisticate on the market today! – DELAY: use a new process! – SOUND STACK: 3 multitimbral stacking modes (8×2, 5×3 or 4×4) with VOLUME, COARSE TUNE and FINE TUNE settings on each voice. – SOUND CREATOR: the most powerful and effective way to create your own sounds on DX7!! – ROLLING MODE: allows using up to 4 sounds per patch!!! – VELOCITY CROSS-SWITCH: allows switching from one sound to other by velocity. Boss RC-300 Loop Station is here! The extension card will change your old classic DX7mkI into a modern full featured MIDI master keyboard taking advantage of the superb DX7 keyboard feel! What will change this extension in your DX7 mkI in detail? – 10 internal 32 voice banks for a total of 320 internal patches ! Hello Jim, you might want to try some Deoxit contact cleaner on the chip sockets for your “E” setup. This is the best studio grade solvent I have found and I have been fixing electronics for many years..
Any oxidation of the chip sockets could cause intermittent operation. I have seen intermittent operation on my “E” setup but I was able to resolve the problem by reseating the “E” board at a slight angle then tightening the screws. The SPECIAL EDITION ROM was developed to enhance the Performance and MIDI capabilities of the Vintage DX7 and to correct many of DX7 known problems. 9. Main volume transmit feature which allows you to transmit MIDI volume information by utilizing the modulation foot controller input. This parameter can also be memorized or saved for each voice. Hey Jim! This supermax card looks awesome.. Where did you get it? Having an arp built into the dx7 would make this thing unstoppable. I’ve recently been using the critter and guitari pocket piano with midi to arppegiate the dx7 and it sounds awesome but having a way to program the arp would be awwweeesome. I gotta get one…..
Hello William! I bought the SuperMax on Ebay from a guy in France. I was surprised to find one on Ebay and snapped it up pretty quick. Indeed it’s been a great addition to the Yamaha DX-7. You can arppegiate the DX-7 in many ways. I think your method works great too! Enjoy! Hello, I am looking for the E software for my DX7 as the battery died and I would like to bring it back to life. If you have this data I would greatly appreciate a copy. After replacing the battery the unit seems to function but no sounds. The funny thing is that I did not know the E board was installed. Hello Jim and thank you very much. As an I.T. tech I am sure you know the frustration of searching for elusive drivers and or documentation. From what I understand there is an initialization procedure that you have to go through when you first install the “E” system. Do you know if this needs to be done again if you replace the battery? I have found copies of the documentation online but they are not legible. I appreciate your help and will be happy to send you some cash via PayPal for your efforts. Yamaha told me that you can’t buy any part for a DX7 other than keys, so replacement rams are not available. My DX7 boots as “E” version 2.02 and works as a controller now but has no sounds. I can cycle through the banks and access ROM cards.but can’t play them. You are a great guy for offering to help. Thanks Jim, I have the initialization procedures on paper but I really need the .syx files as mine were lost when the battery died. I will double check the solder connection as well. Thanks for the recommendation. If you have a sysex dump or have time to dump one from your DX7 it would make my day. I just sent the following files which hopefully are what you need. My apologies for the delay. Thank you Jim, but I need the files for the “E” board. I would love to have a copy of the manual if possible as well. The copy of the “E” manual I found online is torture to try to read. I have sent you a email replay to your gmail account in regard to this. I will be happy to send you some happy holiday cash if you can find the time to help me out. I will be happy to send you $50.00 via PayPal as I don’t expect you to use your time for nothing. Hi again Michael! No need for any payment. I’m happy to help out. My apologies for being just a wee bit slow though…laugh. Enjoy! I’m a bit surprised by the two files SupermaxN.syx you propose. I also own a supermaxed DX7 and when I dump the banks from it, I only get the voices (as a normal DX7 does). So I think passing these two files to someone else won’t be very useful. Or perhaps you found some way to get the whole data (voice + dx7 function + supermax function) out of the dx7 ? If so, I’m interested. Gosh, my mistake. I checked my messages really fast and with the “Supermax” heading on my blog I jumped to the conclusion you were asking for the Supermax files. My sincere apologies. I do have quite a few E! sysex files and have zipped them up in this file. I hope these are what you are looking for. (Email sent!) If not, please let me know again and I’ll check further. I didn’t include documentation as I think you have that already, but the sysex files should all be here. I pretty much have every Yamaha DX-7 sysex file imaginable so these should be it. Happy Holidays and again sorry for the confusion. Enjoy! Hi Jim Thanks for your informative post. The SuperMax looks pretty cool! Do you by any chance know if the SER-7 ROM is compatible with the E! Grey Matter upgrade? I’m not sure but I “think” the E! 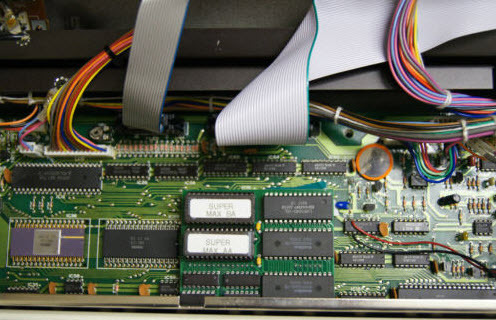 Grey Matter chip may occupy the same slot as the SER-7 ROM upgrade, therefore you wouldn’t be able to install both. If they don’t occupy the same chip slot on the CPU board then I wouldn’t see why not. Just found and picked up a second SuperMax upgrade off Ebay last week for my 2nd Yamaha DX7. I believe there are a couple of guys in France either finding these or making copies. Not sure, but they work great and I’m excited to grab a second one. I really like the SuperMax upgrade better than the E! Grey Matter or SER-7 ROM upgrade. That’s just me though. The SuperMax upgrade has been extremely stable with all the features I could ever imagine. The arp is what I like best though. My dad has a Yamaha DX7 that was upgraded with the Supermax.modification and he has been considering selling it. It is in fairly good condition considering he has owned it since new. It has some scratches and paint missing on edges as well as some slight indentations on some of the buttons (it is over 25 years old!) but looking on Fleabay the original MK1 “brownie” DX7 doesn’t seem to be selling for much and he wouldn’t part with it for thhe kind of prices they are selling for. So the meat of my question would be this – How much more valuable would it be given it has the original Supermax modification? If you can find a SuperMax addition, it will cost on average around $125 on Ebay. I’d markup the DX-7 at least that much to reflect the Supermax board. There is a guy on Ebay from France who still sells the Supermax chip from time to time so I don’t know if it’s super rare yet, but it’s definitely a huge upgrade and you should get compensated for it. Hope this helps. does the supermax work for the DX7IIFD? Hllo Jim, I’m consideer buying the e card for the velocity function. I would like to use my Dx7 as a midimaster keyboard. Does the supermax offer teh same velocity solution to get the Dx7 to send full midi velocity to other boards ? Would you be able to give me the ebay store name/user name of the guy from France who sells these upgrade boards? At the end there is a table with patches and what feature (arp, delay, stacking) is used in the patch. As you can see problem with patches that come with SuperMAX is that they use voice stacking and delay at the same time. This eats up polyphony really quickly. I’ve got a SuperMAX board installed in my DX7. I’m not sure which version though, I’ve had it for about three years. Unfortunately, the directions are about as cryptic as trying to program a stock DX7. Does anyone here have any idea how to disable the SuperMax effects? The SuperMax Delay, as well as some other effect settings seem to be ON on every voice on my DX7, also the wheels and aftertouch are disabled. So far I can disable, change or alter parameters on one voice at a time, but it won’t stay permanent.